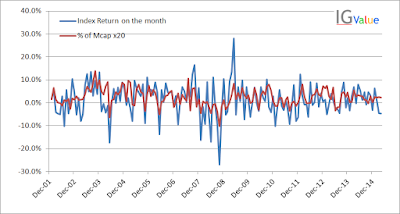 IGValue: Do FII flows drive market returns? This chart has 2 curves: The monthly index return and the % of of the total market cap of the BSE companies that FIIs invested in the country x20 in that month. Upon the first glance the monthly return and FII flows seem fairly correlated – especially the large moves up or down. The mathematical correlation between the 2 curves is 0.56 – which does not show the true picture of the correlation given that 60% of the volume is controlled by the FIIs. As an investor it is a decent thing to keep a tab on the FII flows. When there are massively negative FII flows there are probably several value investment opportunities and vice versa. Of course this has to be accompanied by detailed analysis of the individual stocks.